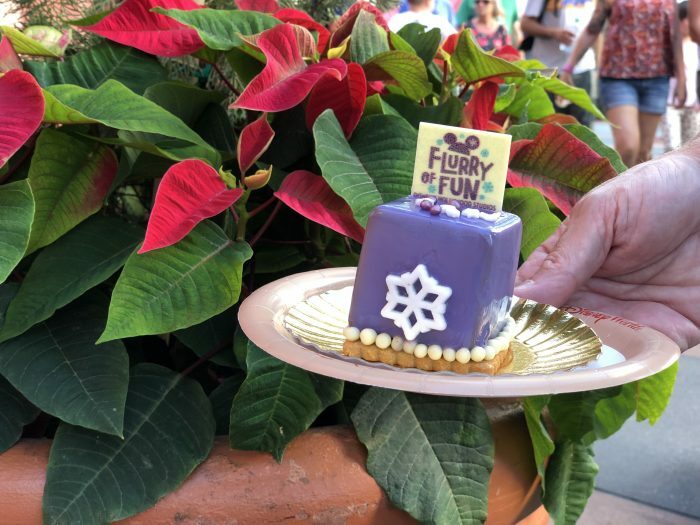 On November 8, Disney’s Hollywood Studios released holiday foods throughout the park as part of the Flurry of Fun promotion. The number of items is daunting but we gave it our best shot for you, dear readers. Even though this was among the last items reviewed, Len declared “I could actually eat all of this.” Considering that he had to be shamed into continuing the reviews after the second stop (“you can’t quit; it’s your JOB to do this”), that’s some high praise. It tastes exactly how it sounds – like eggnog, with raspberry fruit and raspberry crunch for flavor. We’re already fans of the lunchbox tarts at Woody’s. The seasonal flavor is heavy on the apple cinnamon and barely there on the cranberry, with a flaky crust and not overly sweet taste. At $3.29, this is a bargain to boot. 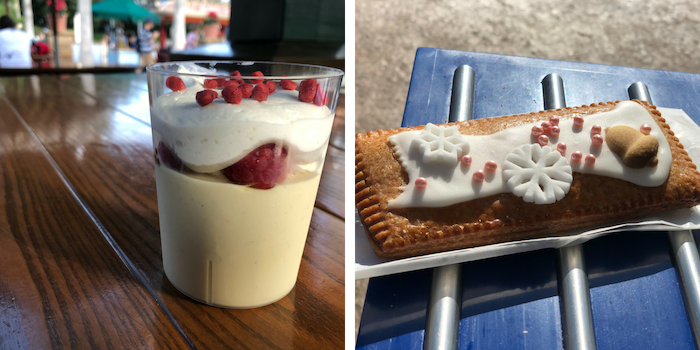 The Eggnog Panna Cotta and Cinnamon Apple Cranberry Lunchbox Tart were the clear winners in our taste test. The photo Disney released of these looks fantastic. The reality isn’t quite the same. It was 85°F on the day we reviewed this, and they did not hold up well in the heat. 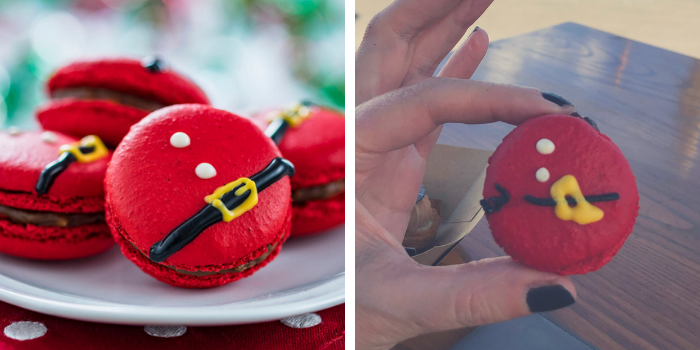 The decorations were melting off as we received the macarons and the texture had already gone to the chewiness of a meringue that likes the Florida weather about as much as I do. It’s a gingerbread man on a stick! The cookie is a perfect chewy gingerbread, the size is good for the price, and it’s super cute. What’s not to like? The Chocolate Chestnut Cone wins this one for best presentation and seasonal appropriate flavor. It’s very light and good for people looking for a dessert that won’t weigh them down. The Spiced Cold Chocolate is a rich, tasty chocolate mousse and chocolate cake in a cup. 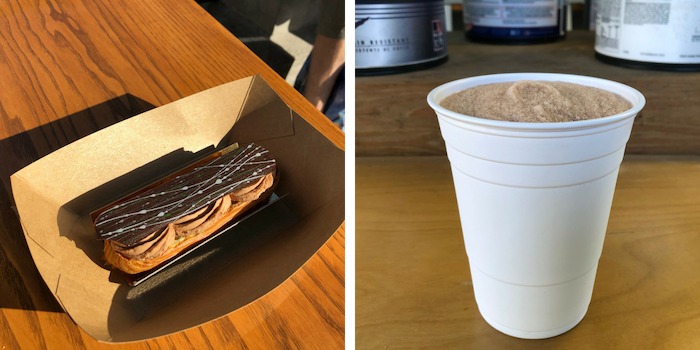 That it’s served in a cup helps it hold up in the heat better than several of the desserts we tried. I’d be hard pressed to pick out a “spiced” flavor, but it’s altogether pleasing for chocolate fans. This is the most heavy of the three chocolate items listed here. The Chocolate Mousse Present is beautiful, but only tastes OK. The texture is airy and light, but the coating was melting before we finished with the photos. Don’t even bother with this. There is nearly no caramel taste and the choux dough shell would get you kicked off a baking competition show. Imagine a cheap fudge-cicle as a watery, icy beverage. Now half the chocolate flavor. That’s this. If you really want a cold, chocolate drink, just head to Starbucks and get a Frappucino. This isn’t just mediocre, it’s not good. Hall of Shame. At least in the case of the Frozen Hot Cocoa we can say it tastes as good as it looks. This is caramel corn mixed with nuts, crispy pearls, candy-coated chocolates, and mini sugar cookies. We imagine it tastes about like that. Sugar cookies large and small, and candied apples. They’re Instagram-friendly and you already know what they taste like. Seasonal cupcakes. Enough with the cupcakes already. Hot Chocolate Flight – Hot Chocolate Flight featuring hot chocolate with Irish liqueur, hot chocolate with vanilla vodka, and hot chocolate with cherry bourbon. The flight can be found at Fairfax Fare. Gumdrop – Made with raspberry liqueur, raspberry vodka, pineapple and cranberry juices, and Sprite, available at The Hollywood Brown Derby Lounge and mobile bars near Echo Lake and Hollywood Scoops. Holiday Mule – Vodka, lemon liqueur, cranberry juice, and ginger beer. Find it at The Hollywood Brown Derby Lounge and mobile bars near Echo Lake and Hollywood Scoops. Christmas on the Beach – Blue liqueur, Caribbean rum, and pineapple and cranberry juices. At The Hollywood Brown Derby Lounge and mobile bars near Echo Lake and Hollywood Scoops. Frosted Gingerbread Martini – Vodka, Irish liqueur, coffee liqueur, gingerbread syrup, and ice cream mix. At Backlot Express. Frostbite Cocktail – Vodka, blue liqueur, cranberry juice, and sour mix. At Dockside Diner and Backlot Express. Winterberry Margarita – Silver tequila, orange liqueur, sour, cranberry juice, and wildberry syrup. At ABC Commissary and Rosie’s All-American Café. So which of these are you looking forward to? Are you hoping for a video of us drinking our way through the cocktails? Talk about it in the comments. 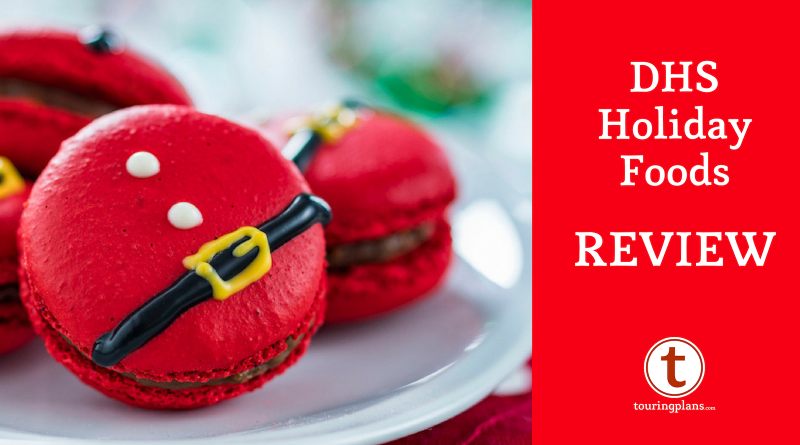 I’d be happy with another blog post of you drinking your way through the holiday beverages. But I’d also watch the video. Great post!